Aim: Considering the importance of bond strength of zirconia ceramic to different core materials, this study aimed to evaluate the effect of a new zirconia primer, a mixture of organophosphate and carboxylic acid monomers, on the bond strength of zirconia to three core materials cemented with a self-adhesive resin cement. Materials and Methods: The study was done on 36 disk-shaped zirconia specimens in the case (receiving new zirconia primer) and control groups (n = 18) and three core material subgroups (n = 6) (amalgam, nickel–chromium [Ni-Cr], and composite resin). A self-adhesive resin-based luting agent bonded the two parts together. The shear bond strength was tested and the facture modes were determined. Two-way ANOVA and Tukey's honestly significant difference tests were used for data analyses (α = 0.05). Results: Zirconia primer could not significantly increase the bond strength of zirconia ceramic to different core materials (P = 0.754). Composite resin and amalgam cores showed significantly higher bond strength than Ni-Cr core (P = 0.001). On using zirconia primer, 100% of failures of composite resin cores were cohesive inside the core material, 75% in amalgam core and 100% in Ni-Cr core were adhesive. Conclusions: The use of new zirconia primer based on organophosphate/carboxylic acid monomers could not enhance the bond strength of zirconia ceramic to different core materials. The bond strength of zirconia to amalgam and composite resin cores was higher than that to Ni-Cr core material. Application of zirconia primer is a novel approach to strengthen the zirconia–resin bond. Scientists have combined the organophosphate and carboxylic acid monomers to introduce a new zirconia primer. This material allows copolymerization between the organofunctional part of the organophosphate monomer and the monomers of the resin luting agents, besides the establishment of a bond between its phosphoric acid groups and the metal oxide in zirconia., Carboxylic acid is the other constituent monomer in this primer which contributes to the development of the bond. A quite frequent procedure in dentistry is the restoration of the tooth surfaces that are compromised by caries, traumas, or endodontic treatments. In many cases, the missing tooth structure is compensated for with a foundation material, which can further bear an indirect restoration that is cemented in place with luting cement. Some examples of the materials that can be used for core restorations are casting cores, amalgam, composite resin, glass ionomer, porcelain, and compomer. An ideal core material is supposed to be biocompatible, has adequate compressive and flexural strength, and establishes desirable bond with the tooth structure and luting cement. The success and durability of fixed dental prosthesis highly relies on factors such as the type of core material, biophysical characteristics of the luting cement, and core material-luting cement bond strength.,, Most endodontically treated teeth need to receive one type of the post and core systems before being restored with all-ceramic zirconia-based restorations. Moreover, controversies still exist regarding the bonding durability between the resin cement and zirconia copings and different core materials. Therefore, the present study was planned to investigate the effect of applying a new zirconia primer (Z-Prime Plus) on the bond strength of zirconia to three different core materials cemented using a self-adhesive resin cement. In this experimentalin vitro study, 36 disk-shaped zirconia specimens (5 mm × 3 mm) were fabricated using computer-aided design/computer-aided manufacturing (CAD/CAM; Cercon CAD/CAM, DeguDent Dentsply Intl., Hanau, Germany). They were divided into case and control groups (n = 18) based on the application of zirconia primer. Each group was then subdivided into three subgroups (n = 6) based on the employed core materials which were amalgam, composite resin, and nickel–chromium (Ni-Cr) cores. [Table 1] displays the employed materials in detail. [Figure 1] shows the groups and subgroups of specimens. Thirty-six disk-shaped core specimens (7 mm × 7 mm) were prepared (n = 12 per each core material) in a Teflon mold. The composite resin cores were built up in two 3.5-mm high incremental layers, each of which was light polymerized with a light-emitting diode device (Radipus LED, SDI, Victoria, Australia) at 1000 mW/cm2 for 20 s. The amalgam core specimens were made by simply packing amalgam into the mold. The Ni-Cr cores were fabricated using a fabricated mold to make wax patterns of the same shape and dimensions. The lost wax technique was used for casting Ni-Cr alloy in an induction-casting machine (Pressovac, Aseg Galloni, Milan, Italy). Using a surveyor, each core specimens was embedded in an acrylic resin base (Acropars Re; Marlic Co., Tehran, Iran) to a height such that only 1 mm of the core material was exposed on top of the resin surface. The zirconia specimens in the case group received a layer of zirconia primer (Z-Prime Plus; Bisco, Illinois, United States) according to the manufacturer's instruction. The front side of core specimens was covered with self-adhesive resin cement (Clearfil SA luting cement; Kuraray, Tokyo, Japan) according to the manufacturer's instructions. However, for the specimens in the case group, the luting cement was administered only after applying a thin layer of zirconia primer. The core specimens were then pressed onto the zirconia specimens. Inspired by Al-Harbi et al. 's study, the cement was allowed to flow under a constant pressure of 49 N for 20 s. The extra amount of resin was removed with a brush, and then, both sides of the specimens were light polymerized for a total of 80 s. The prepared specimens were kept in distilled water at 37°C for 24 h before undergoing the shear bond strength (SBS) test. To measure the SBS, the specimens were mounted in the jig of a universal testing machine (Instron Model 8871; Instron Corp., Massachusetts, USA). The adhesive interface was loaded with a force of a constant crosshead speed of 0.5 mm/min until failure occurred [Figure 2]. The failure loads were automatically converted to MPa through dividing the load (N) by the bonding area (mm2). The fracture mode (cohesive, adhesive, or mixed) was analyzed with a stereomicroscope (BS-3060C; Best Scope, China) at ×8 and with scanning electron microscope (Cambridge SEM 260, UK) at ×30 and ×150. The failure mode was defined as adhesive when more than 75% of the core surface was visible. The cohesive failure mode was when more than 75% of the core surface was covered with resin or the fracture was inside the core material. All other cases were classified as mixed failure mode. The statistical analyses were performed using SPSS software (version 19.0; IBM Corp., Illinois, USA). Two-way ANOVA was used to assess the effects of zirconia primer and three different core materials on the SBS of zirconia to different core materials, and Tukey's honestly significant difference (HSD) test was used for pairwise comparisons (α = 0.5). [Table 2] shows the mean and standard deviations of the SBS values as analyzed with Tukey's HSD test. As displayed in [Table 3], the results of two-way ANOVA showed that the zirconia primer had no significant effect on the SBS of zirconia to core materials (P = 0.754). However, different core materials significantly influenced the SBS of zirconia to the core (P = 0.001). Composite resin and amalgam cores showed significantly higher bond strength than Ni-Cr core (P < 0.05). The difference between composite resin core and amalgam core was not statistically significant (P > 0.05). According to [Table 4], the failure mode for composite resin core was cohesive inside the core material for all specimens (100%) in both case and control group [Figure 3]. Most failures of amalgam cores (75%) were adhesive in both case and control groups [Figure 4]. In Ni-Cr core material with zirconia primer, all of the failures were adhesive. Finally, the Ni-Cr core material without zirconia primer application showed 50% adhesive, 25% cohesive, and 25% mixed failure pattern [Figure 5]. This study tried to investigate if a new organophosphate/carboxylic acid primer could affect the SBS between zirconia ceramic and three different core materials bonded with a self-adhesive dual-cure resin cement. The findings proved that this zirconia primer could not significantly enhance the SBS of zirconia ceramic to different core materials. Studies were performed to find out if the zirconia–resin cement bond could be strengthened using a new zirconia primer (a mixture of organophosphate and carboxylic acid monomer)., Copolymerization occurs between the monomers of resin luting agent and the organofunctional constituent of the organophosphate monomer. Moreover, it is believed that the present phosphoric acid groups would establish a bond with the metal oxide in zirconia., The other imperative factor in bond development of this primer is the carboxylic acid. Magne et al. observed that using this new zirconia primer considerably improved the bond strength of zirconia to different resin luting agents (Biscem, Duo-Link, and Panavia F). Torabi Ardakani et al. found that this zirconia primer significantly strengthened the bond between zirconia posts and the root canal dentin cemented with either self-etch or self-adhesive resin cement (Panavia F and Clearfil SA luting cement). Our findings were different from those of the previous studies can be related to the difference in the nature of the tooth and core materials (Ni-Cr, amalgam, and composite resin). Unlike the core materials, the tooth can create stronger micromechanical bond with the resin cement. Therefore, failures of zirconia–resin cement are more common when zirconia is cemented to the tooth structure using resin cement. Since the core materials cannot establish such a strong micromechanical bond with the resin cement, when the zirconia is bonded to the core materials, applying a shear force to the junction of the two results in failure between the resin cement and the core materials. Conforming to that, the present findings revealed a predominance of adhesive failures between the core materials and resin cement, except for the composite resin core. Adhesive failures were observed in 50% of the Ni-Cr core specimens before using the zirconia primer, which raised up to 100% in the group that received zirconia primer. It affirms the effect of this new zirconia primer on the failure mode between zirconia and core materials. The current results showed significantly different bond strength values between the zirconia ceramic and different core materials. Composite resin and amalgam cores showed significantly higher bond strength to zirconia than Ni-Cr core material. The difference between the amalgam and Ni-Cr cores can be related to the higher surface roughness of amalgam than the Ni-Cr cores. The higher surface roughness of amalgam allows greater mechanical retention between the amalgam core and resin cement. Likewise, the higher bond strength of composite resin compared with the Ni-Cr core can be due to the chemical bonds created between the composite resin core and resin cement. Scanning electron microscopy (SEM) analysis showed that 100% of failures for composite resin cores were cohesive inside the core material. It implies that using this resin cement to bond the zirconia ceramic to composite resin core yielded stronger bond than the cohesive strength of resin composite. Patil et al. reported that the bond strength of the luting cement to composite resin core was higher than that to amalgam core when resin-modified glass ionomer was used as a luting cement. In the present study, the bond strength of amalgam and composite core was not significantly different, due to the early cohesive failures of composite resin cores within the core material. Al-Harbi et al. detected no difference between the bond strength of zirconia ceramic to composite resin core and Ni-Cr core. This can be related to the different surface roughness and topography of the core materials, as well as the type of resin cement and zirconia primer used in that study. The SEM analysis of failure pattern can help explaining the	bond strength results. In the present study, low bond strength values were usually associated with adhesive failure, while higher bond strength values were often associated with mixed or cohesive failures. This finding was also reported by other researchers.,, All the failures in the composite resin cores appeared completely cohesive within the composite. Likewise, Al-Harbi et al. showed that using BisCem cement with composite resin core resulted in a cohesive failure mode in all cases. The present study found coincidence of the cohesive failure pattern with relatively high bond strength value. Van Ende et al. believed that such finding might indicate that the exhibited stress exceeded the tensile strength of the composite before the real bond strength was appeared. 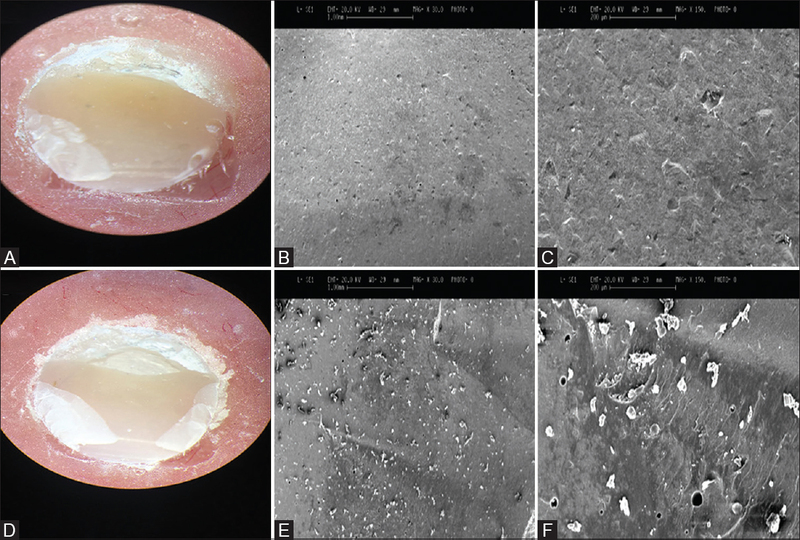 On the contrary, most of failures in amalgam and Ni-Cr cores were adhesive between the resin cement and core material. 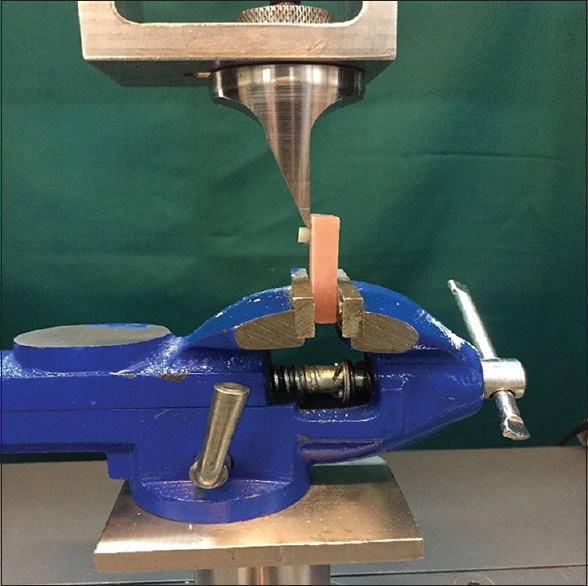 One of the limitations of this study was missing to evaluate the effect of thermomechanical cycling on the durability of the bond strength of Y-TZP ceramics bonded to different core materials using this new zirconia primer and self-adhesive resin cement. Further studies are suggested to consider evaluating the effects of this contributing factor. With respect to the results of this study, it was concluded that the organophosphate/carboxylic acid primer (Z-Prime Plus) could not significantly increase the bond strength of zirconia (Y-TZP) to different core materials. Moreover, we found significantly higher bond strength of zirconia ceramic to amalgam and composite resin cores than that to Ni-Cr cores. It can also be concluded that the failure mode of zirconia to Ni-Cr (100%) and amalgam core (75%) are mostly adhesive, while the failure pattern of zirconia ceramic to composite resin core is always (100%) cohesive within the composite resin core when using zirconia primer and a self-adhesive resin cement. The authors would like to thank the Vice-Chancellery of Research of Shiraz University of Medical Sciences for financially supporting this research. This article was based on the thesis by Reza Zarkari for partial fulfillment of DDS degree. Appreciations are also expressed to Dr. Mehrdad Vossoughi from the Dental Research Development Center, for his help with the statistical analyses and also Farzaneh Rasouli for improving the use of English in this manuscript. This study is financially supported by the Shiraz University of Medical Sciences (Grant#95-01-102-12872). Pittayachawan P, McDonald A, Petrie A, Knowles JC. The biaxial flexural strength and fatigue property of lava Y-TZP dental ceramic. Dent Mater 2007;23:1018-29. Cavalcanti AN, Foxton RM, Watson TF, Oliveira MT, Giannini M, Marchi GM, et al. Y-TZP ceramics: Key concepts for clinical application. Oper Dent 2009;34:344-51. Dayalan M, Jairaj A, Nagaraj KR, Savadi RC. An evaluation of fracture strength of zirconium oxide posts fabricated using CAD-CAM technology compared with prefabricated glass fibre posts. J Indian Prosthodont Soc 2010;10:213-8. Soundar SI, Suneetha TJ, Angelo MC, Kovoor LC. Analysis of fracture resistance of endodontically treated teeth restored with different post and core system of variable diameters: An in vitro study. J Indian Prosthodont Soc 2014;14:144-50. Gundugollu Y, Yalavarthy RS, Krishna MH, Kalluri S, Pydi SK, Tedlapu SK, et al. Comparison of the effect of monolithic and layered zirconia on natural teeth wear: An in vitro study. J Indian Prosthodont Soc 2018;18:336-42. Reed JS, Lejus AM. Affect of grinding and polishing on near-surface phase transformations in zirconia. Mater Res Bull 1977;12:949-54. Valandro LF, Ozcan M, Amaral R, Leite FP, Bottino MA. 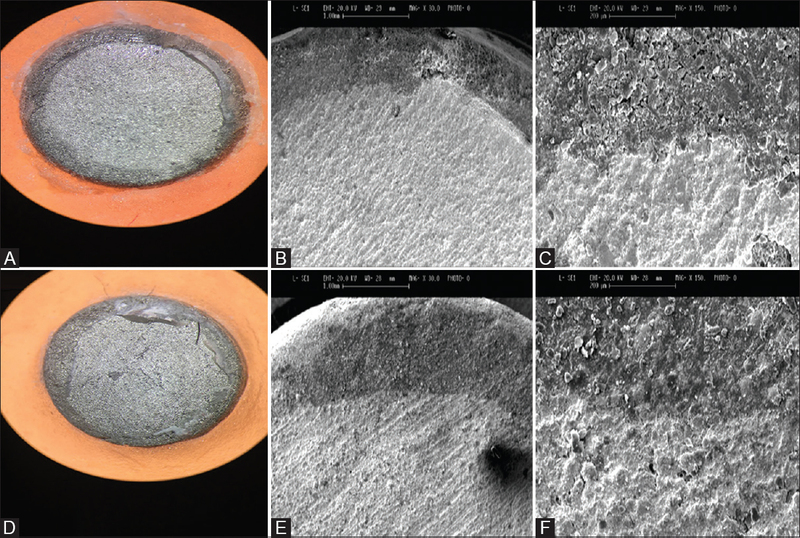 Microtensile bond strength of a resin cement to silica-coated and silanized in-ceram zirconia before and after aging. Int J Prosthodont 2007;20:70-2. Foxton RM, Cavalcanti AN, Nakajima M, Pilecki P, Sherriff M, Melo L, et al. Durability of resin cement bond to aluminium oxide and zirconia ceramics after air abrasion and laser treatment. J Prosthodont 2011;20:84-92. 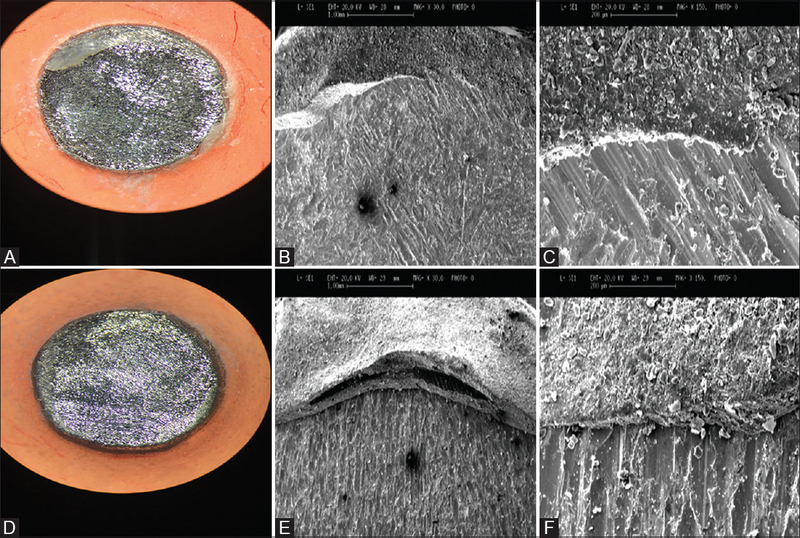 Menon NS, Kumar GP, Jnanadev KR, Satish Babu CL, Shetty S. Assessment and comparison of retention of zirconia copings luted with different cements onto zirconia and titanium abutments: An in vitro study. J Indian Prosthodont Soc 2016;16:136-41. Sadighpour L, Fazel A, Geramipanah F, Allahdadi M. Effect of resin cement mixing method on the retention strength of a CAD/CAM zirconia crowns. J Indian Prosthodont Soc 2014;14:31-6. Al-Helou H, Swed E. Effect of metal type and surface treatment on shear bond strength of resin cement (in vitro study). J Indian Prosthodont Soc 2016;16:49-52. Lorenzoni FC, Leme VP, Santos LA, de Oliveira PC, Martins LM, Bonfante G, et al. Evaluation of chemical treatment on zirconia surface with two primer agents and an alkaline solution on bond strength. Oper Dent 2012;37:625-33. Reddy SM, Vijitha D, Deepak T, Balasubramanian R, Satish A. Evaluation of shear bond strength of zirconia bonded to dentin after various surface treatments of zirconia. J Indian Prosthodont Soc 2014;14:38-41. Mattiello RD, Coelho TM, Insaurralde E, Coelho AA, Terra GP, Kasuya AV, et al. A review of surface treatment methods to improve the adhesive cementation of zirconia-based ceramics. ISRN Biomater 2013;2013;10. Torabi Ardakani M, Giti R, Taghva M, Javanmardi S. Effect of a zirconia primer on the push-out bond strength of zirconia ceramic posts to root canal dentin. J Prosthet Dent 2015;114:398-402. Magne P, Paranhos MP, Burnett LH Jr. New zirconia primer improves bond strength of resin-based cements. Dent Mater 2010;26:345-52. Hewlett S, Wadenya RO, Mante FK. Bond strength of luting cements to core foundation materials. Compend Contin Educ Dent 2010;31:140-6. Bayindir YZ, Bayindir F, Akyil MS. Bond strength of permanent cements in cementing cast to crown different core build-up materials. Dent Mater J 2004;23:117-20. Patil SM, Kamble VB, Desai RG, Arabbi KC, Prakash V. Comparative evaluation of shear bond strength of luting cements to different core buildup materials in lactic acid buffer solution. J Clin Diagn Res 2015;9:ZC84-7. Shetty M, Rajalakshmi S, Krishna Prasad D. Comparison of marginal gap and microleakage in copy-milled and cad-milled zirconia copings bonded using light cure and chemical cure resin bonding systems. J Indian Prosthodont Soc 2014;14:37-45. Farzin M, Giti R, Asalforush-Rezaiye A. The effect of multiple firings on the shear bond strength of porcelain to a new millable alloy and a conventional casting alloy. Materials (Basel) 2018;11. pii: E478. Al-Harbi FA, Ayad NM, Khan ZA, Mahrous AA, Morgano SM.In vitro shear bond strength of Y-TZP ceramics to different core materials with the use of three primer/resin cement systems. J Prosthet Dent 2016;115:84-9. Della Bona A, Borba M, Benetti P, Cecchetti D. Effect of surface treatments on the bond strength of a zirconia-reinforced ceramic to composite resin. Braz Oral Res 2007;21:10-5. Cavalcanti AN, Foxton RM, Watson TF, Oliveira MT, Giannini M, Marchi GM, et al. Bond strength of resin cements to a zirconia ceramic with different surface treatments. Oper Dent 2009;34:280-7. Dias de Souza GM, Thompson VP, Braga RR. Effect of metal primers on microtensile bond strength between zirconia and resin cements. J Prosthet Dent 2011;105:296-303. Yoshida K, Tsuo Y, Atsuta M. Bonding of dual-cured resin cement to zirconia ceramic using phosphate acid ester monomer and zirconate coupler. J Biomed Mater Res B Appl Biomater 2006;77:28-33. Tanaka R, Fujishima A, Shibata Y, Manabe A, Miyazaki T. Cooperation of phosphate monomer and silica modification on zirconia. J Dent Res 2008;87:666-70.
de Souza G, Hennig D, Aggarwal A, Tam LE. The use of MDP-based materials for bonding to zirconia. J Prosthet Dent 2014;112:895-902. Durmuşlar S, Ölmez A. Microtensile bond strength and failure modes of flowable composites on primary dentin with application of different adhesive strategies. Contemp Clin Dent 2017;8:373-9. Kaimal A, Ramdev P, Shruthi CS. Evaluation of effect of zirconia surface treatment, using plasma of argon and silane, on the shear bond strength of two composite resin cements. J Clin Diagn Res 2017;11:ZC39-43. Van Ende A, De Munck J, Van Landuyt KL, Poitevin A, Peumans M, Van Meerbeek B, et al. Bulk-filling of high C-factor posterior cavities: Effect on adhesion to cavity-bottom dentin. Dent Mater 2013;29:269-77.